What do our new 1968 510, Jason’s 1967 411 wagon, and the 1971-72 Trans-Am Champion #46 BRE Datsun 510 have in common? Not much, aside from the fact that they’re almost all older then most of us…and the fact that two weeks ago, they were all present at Les Cannaday’s shop. That weekend, Greg and I made a banzai run to California to drop off two motors, pick up a 411 for our friend Jason (rotorimp), and pick up the 510 that we had bought. That Sunday evening, Aaron called Greg and I to let us know that he was going to run out of daylight long before he arrived in Vista. We asked him if there was anywhere we could unload the 411 off the trailer so we could come pick him and the Dime up. He calls his boss who graciously offers to let us use his lot. Enter Les Cannaday. Yeah, that’s right, the Les Cannaday. For those of you familiar with classic Datsuns: Fairlady Roadsters, 510s, and early Zs, Les is the foremost expert authority on restoration, racing history, production, and parts procurement. 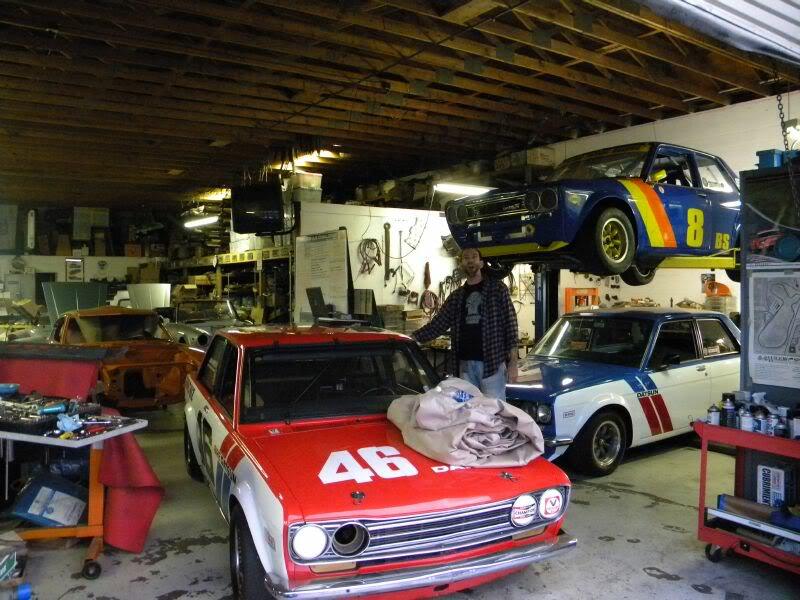 Les is the owner / operator of Classic Datsun Motorsports in Vista, California. His restorations are out of this world… and once you enter his world, there seems to be no part that is ever obsolete or unobtainable. He has parts in his shop most people gave up looking for twenty years ago, including a part for our 411 that couldn’t be found anywhere else in the continental US. He is a friend with some of the most notable names in the Datsun world, including Mr. K himself. He’s built cars for Adam Carolla, The Datsun Heritage Museum, Bob Bondurant, Bill Pritchard, and many others… He procured and prepared almost all of the cars for the famous “Dream Garage” poster for Nissan, and is currently prepping the #46 BRE Datsun 510 for an appearance at The Mitty in Atlanta, GA. He is also one of the nicest guys I have ever met. Sunday evening, Greg and I pulled into the lot of Classic Datsun Motorsports headquarters. Les was kind enough to help us unload the 411 and gave us a brief introductory tour of the facility. 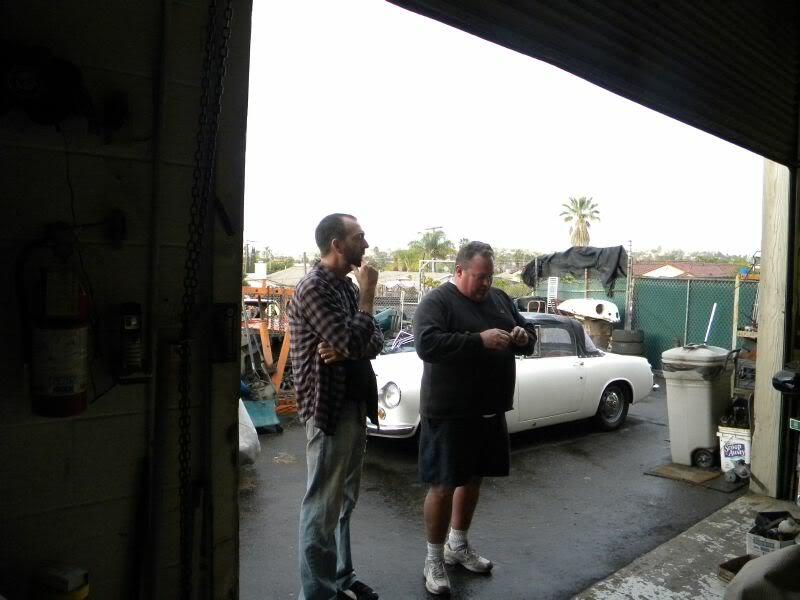 Being the legend that he is and having so many priceless and pristine examples of antique Datsun memorabilia, I was really hesitant to even peek through the doorway of the enormous shop. However, he made it very clear that not only could I wander in the shop, I could look around and take as many pictures as I wanted. He is proud of the cars he has built, the things that he has accomplished, and the memorabilia he has collected. The fact that he was willing to share all of that with us just blew me away. It is very low key, kind of obscure, just a comfortable place to hang out… Nothing pretentious, just the way you’d imagine “Datsun Heaven”. You’d never guess all of the amazing things that happen behind those walls. He and Greg continued to talk old Datsuns amongst themselves, but as soon as he told me I could take pictures, I went exploring. The first thing that caught my eye was the trio of 510s in the doorway. When I realized that the #46 car was THE #46 car, I just stood there staring at it. It was like being in the presence of a superstar, I was awestruck. Absolutely gorgeous, as was Adam’s next to it, and Bill’s on the lift above. I was standing in the center of a triangle of historical Datsun significance.